At Mohawk’s Stoney Creek campus, a multidisciplinary research and teaching lab showcases the sustainable and energy efficient future in an ingenious way. It’s a small two-story house that wouldn’t look out of place on any residential street. But its modest exterior hides a secret: the house is built with the most advanced materials, connected to renewable generation, outfitted with energy efficient heating and cooling technology, utilizing energy storage and wired top to bottom with sensors that monitor insulation efficiency. The house is a living lab, facilitating opportunities for research, innovation and teaching that will benefit industry, academics and teachers. It’s a modern home that allows visitors to visualize every aspect of energy and power research that is taking place in the space. 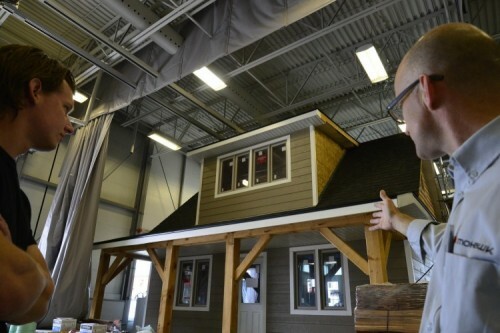 You can’t find it using Google Maps- the almost-completed eco-friendly house is located at Mohawk’s Stoney Creek Campus, housed within a soaring three story lab space that is dedicated to everything sustainable. The house is part of the Sustainable Resource Centre, a centre dedicated to helping us reduce our environmental impact and focused on the pillars of clean energy, reuse of resources and waste minimization. As more homes adopt energy storage, renewable energy and start selling back to the grid, Researchers with the Mohawk College iDeaWORKS Energy Research Centre - which has labs located at both Mohawk’s Fennell and Stoney Creek campuses- wanted to learn more about how it wouldimpact the grid, especially on the power distribution equipment and transformers. Their research interests found a home in the new eco-house. New energy efficient appliances, like our dishwashers and washing machines, are generating more harmonic frequencies than their previous iterations. These harmonic frequencies are undesirable, as they impact power quality and can shorten the lives of transformers. Energy researchers based at Mohawk College recently presented a paper at the 2015 IEEE conference on the topic, showing how harmonics generated by solar, energy-saving home appliances and electric vehicle chargers pose a potential threat to the distribution network systems. If they are allowed to continue unabated it could cause fuse failures and premature failure of pole-mount transformers. Mike Dang, a researcher with the Energy Centre, and a retired employee of Hydro One, calls the transformer failures that are coming from the energy efficient appliances “a costly and dangerous failure”. Peter Sztur, the Bachelor of Technology in Energy Engineering student who works with the iDeaWORKS Energy team sums up the issue with harmonics and the push on using energy efficient appliances. “It will be a very good research and development house.” says Ivan Sverko. Sverko is a Conventional and Renewable Energies Professor at Mohawk’s Stoney Creek campus.Like the researchers in energy and power, Sverko is also using the house to solve problems and test new technologies in the area of renewable energy. He is just one of the many Mohawk faculty that helped in the planning and implementation of the lab and he’ll continue to use the lab to conduct renewable energy projects and integrate the lab into his teaching on renewable and sustainable energy systems. Sverko, his colleagues and students are using heat testing to see how effective the house is on the whole. The house itself was built using energy efficient materials and has been outfitted with the latest in heating and cooling technology, including geothermal and radiant floor heating. It’s also linked to solar panels and wind turbines located on the roof of the Stoney Creek campus. “Once we outfit the house with the temperature sensors, we will determine out the amount of heating needed to heat the house, and figure out how efficient the house is at keeping things warm without needing to have a heat source that needs to be used as often,” explains Sverko. “We are solving problems, we are reinventing the wheel,” says Sverko.